Don Hardy B.M.T., M.T.A. | MTC Studio Inc.
To say that Don Hardy is a music educator, composer, performer and a Music Therapist misses much of the point. That music is his raison d’etre is much closer. He is an experienced clinician with Music Therapist Accredited (MTA) status with the Canadian Association for Music Therapy (CAMT). Don is also a member of the Music Therapy Association of British Columbia (MTABC). He combines his music therapy work with music education, and continues to have a busy jazz performance schedule in the Vancouver music scene, both as a soloist and accompanist. 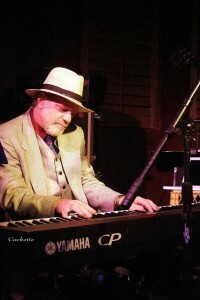 His plays with own quartet, Guilty Pleasures, and has worked major festivals in Canada, including the Vancouver International Jazz Festival, with other artists. He brings this musical experience to his music education and music therapy practices. His area of expertise includes working with children with Autism, Asperger’s, Rett Syndrome, Cerebral Palsy, Down’s Syndrome, and traumatic brain injury. See the Audio and Video page for samples of Don’s music and conference presentations.